Near town, south on Goose Pasture Tarn, Lakeshore is spacious and quiet. Beginning in 1968, the Lakeshore homes for sale came into existence on the shores of Goose Pasture Tarn, in the small town of Blue River that is on the south end of the Breckenridge area. Home sites in Lakeshore were developed on the high land above the tarn with views of the surrounding mountains. The lots are at least ½ acre so Lakeshore offers varying degrees of privacy from good to great, all lying between the wetlands around the tarn and Highway 9. All residents have fishing and boating rights on the lake, which has been stocked and the shoreline improved in recent years. Paddling - standing or sitting - is certainly an option on this cold, but neighborly lake. Hiking from the Lakeshore requires a little jog around the end of the lake but connect with the Blue River trails that joins other trails into town and up to Boreas Pass. 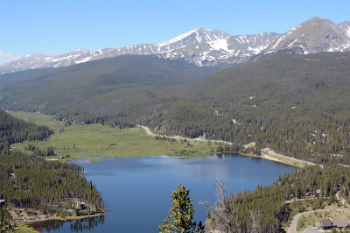 Nearby trails include the Spruce Creek trail to Mohawk Lakes, one of the most popular hiking trails in the Breckenridge area because it is a relatively short hike that yeilds spectacular views. The trailhead begins across Highway 9 from the Lakeshore. Every Lakeshore home was custom built and because of the age of the subdivision are in varying styles and in different conditions. However, this neighborhood is so close to downtown, central Breckenridge, that it has remained in high demand and many homes have been expanded or remodeled since they were first built, and maintained at a high standard. The lots are large and the home's here tend to have relatively large interior spaces, as well as exterior decks. Likewise, this lack of land pressure has lead to most of the homes being lower in overall height. About 1/10 of Lakeshore homes will have been built in the 2000s, and four lots remain undeveloped. Size: 1280 sq. ft. to 5743 sq. 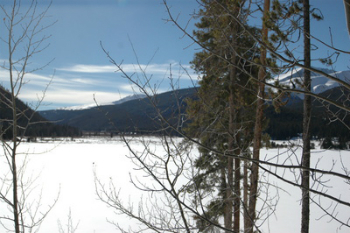 ft.
From the center of Breckenridge, head south on Highway 9. After 1.2 miles turn right on Lakeshore Loop.